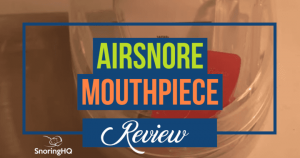 The Therasnore Mouthpiece – Does it Live up to the Hype? Oh, how I have tried to cure myself of snoring. Nasal strips, nasal spray, acupressure, dieting – I’ve tried every known remedy and treatment. I was officially at the bottom of the snore-cure bucket, and it was time to put aside my prejudices and give the Therasnore Mouthpiece a try, in the hopes of finally getting an entire night of sleep. The verdict? I wish I’d tried it years ago! 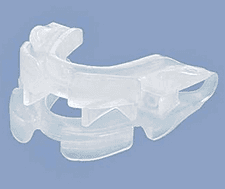 The Therasnore is a Mandibular Advancement Device (or MAD), one of the anti snoring devices that works by sitting in the mouth and gently holding forward the jaw and tongue while you sleep (Both SnoreRx and Zyppah do the same). The idea is that this opens up the throat and clears any obstruction from the airways, which results in smooth, soundless breathing. The company’s website boasts a 93% success rate when using this mouthpiece, a claim that seems to be supported by the fact that this is one of the world’s most popular MADs. I was sold! I unbox and demonstrate one of the best snoring mouthpieces. I went for the adjustable Therasnore, which is customizable after fitting and has five different jaw extension settings. To custom mold the Therasnore I had to separate the upper and lower jaw pieces, this is quite hard as the pieces are stuck together when they first ship. Next, each part of the mouthpiece must be molded in hot water, but separately. They give detailed instructions when they ship it, but there are fifteen steps to follow. With both the upper and lower jaw pieces all set up and ready to go, I was excited to try it out that night. I had expected to be totally unable to sleep when wearing a mouthpiece but was pleasantly surprised to find that I drifted off just as easily as usual. 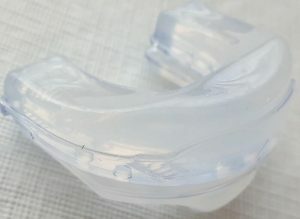 The device is far more comfortable than you might expect, not too bulky or intrusive-feeling, and the custom fit meant that no bits were sticking into my mouth or rubbing against my gums. 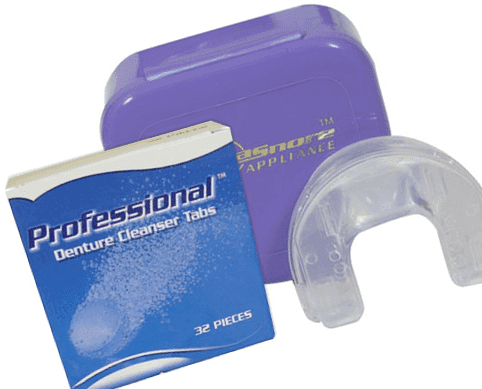 The mouthpiece fits firmly, but the material is soft and gentle on the gums, so the overall comfort was a welcome surprise. I woke up feeling refreshed and well rested, which was a promising sign. But had it worked? I rolled over to find my wife not only still in the same bed, but still sound asleep and not glaring reproachfully up at me from her pillow! I quickly shook her awake to ask how she’d slept… and she HAD slept! Apparently, I hadn’t snored all night, not even slightly. We were both overjoyed! My jaw, admittedly, was a little sore that first morning, though not enough to discourage me from continuing to use the mouthpiece, given the success of that first night. The soreness persevered for a few days, but by night five the mouthpiece had started to feel like second nature, and my jaw was no longer complaining. Two weeks in and I don’t know how I lived without it, or why it took me so long to get around to buying one! My snoring has ceased, the Therasnore is now so comfortable that it feels like it was made to sit in my mouth (which, technically, it was) and my wife and I are both happy and better rested than we have been in years. Value for money: Although the price tag may put off some prospective buyers, you have to think to the long-term with this one. The Therasnore lasts for up to two years and has a lot of testimonials as to its durability online, so it is a long-term solution to your snoring woes. Clinically recommended: This device is recommended by doctors in both the U.S. and the UK, and has some convincing clinical evidence behind it. These clinical studies are linked to the official Therasnore website, and certainly, add weight to the claims of the company regarding the effectiveness of the device. Being able to read up on the science behind this product is a nice touch, in my opinion, and is quite a novel and reassuring way to give a product credibility. Comfort: The fact that you can adjust the jaw extension settings is a big advantage of this product, and meant that I was able to position it in such a way that my jaw wasn’t thrust too far forward. This, combined with the soft material, and the ‘boil and bite’ method of molding the mouthpiece, resulted in a fit that was more comfortable than I ever anticipated. Hygienic: The Therasnore is very quick and easy to clean, which is, of course, essential for something that’s going to be sitting in your mouth for long periods of time. The fact that it comes with an eight-month supply of cleaning tablets is a nice touch. FDA/NHS approved: This device is recommended by official bodies on both sides of the pond, and finding a product whose quality is internationally recognized is very reassuring! (Temporary) Drool and jaw ache: Although this mouthpiece was more comfortable than I ever thought possible, it still takes some time to adjust to sleeping with it in your mouth. The increased salivation was immediate, and although it seemed to stop when I fell asleep, left me with a large wet patch on my pillow for the first two nights. The jaw-soreness took a little longer to go, but was mild and only lasted five days in the end. It takes a little getting used to, but these are minor issues that it’s certainly worth pushing through. Unsuitable for denture wearers: Again, this one doesn’t affect me, but if you wear dentures or implants this device will not work for you. Would I recommend the Therasnore? Absolutely! 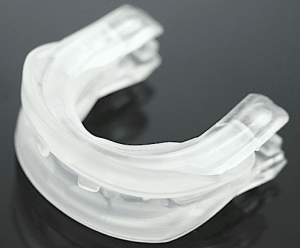 I found this mouthpiece to be comfortable, professionally designed, and (most importantly) highly effective. My quality of sleep has improved tenfold, and the knock-on effects in my day-to-day life are significant. I’m more alert, my relationships have improved, and even my general mood has taken an upswing. I wish I’d tried it years ago! Give the Therasnore mouthpiece a try. Of course, you are probably familiar with the more well-known anti-snoring devices such as SnoreRx and ZQuiet. If you haven’t tried those yet, please read my reviews on each.